During the most turbulent times in our recent history, when it appeared that the world of the great European yeshivos was about to be obliterated and the chain of their mesorah broken, a lion in Torah arose to fill the breach. 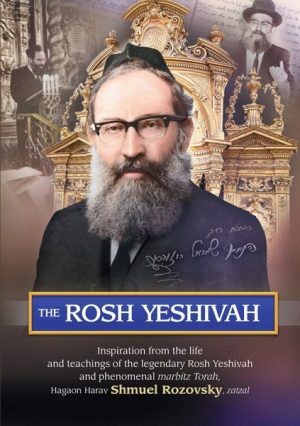 This book tells the story of a true Torah giant, whose essence was Torah and without whom it is impossible to imagine the rebirth of the yeshivah world in our days. Born in Grodno, Poland, Harav Shmuel Rozovsky gained renown from an early age as a prodigious ilui. He was one of the most outstanding talmidim of Harav Shimon Shkop, whose Torah and derech halimud he strove all his life to transmit. Saved from the Nazi inferno, he was chosen by Harav Yosef Shlomo Kahaneman to become the first rosh yeshivahof his fledgling institution, the great Torah empire of Ponovezh. Rav Shmuel thus became the bridge between the glorious past of European yeshivos and the bright future of Torah in Eretz Yisrael. Rav Shmuel handpicked the first five talmidim of Yeshivas Ponovezh, and he tenderly nurtured the yeshivah until it attained its status as one of the preeminent yeshivos in the world. Rav Shmuel’s masterful daily and weekly shiurim attracted talmidim from all over Eretz Yisrael and from around the world. Each page of this remarkable, meticulously researched book offers readers the timeless wisdom of Torah, along with inspiration and lessons for a life of ahavas haTorah, simchas haTorah, and amal haTorah. Rav Shmuel will never be forgotten; he lives on in the thousands of talmidim who consider him their rebbi. This book is a beautiful depiction of Rav Shmuel’s powerful personality, brilliance, and influence.